The manager has come under heavy fire since taking over at Chelsea. Maurizio Sarri remains defiant about implementing his possession based philosophy at Chelsea despite continued groans from the fanbase over his management. 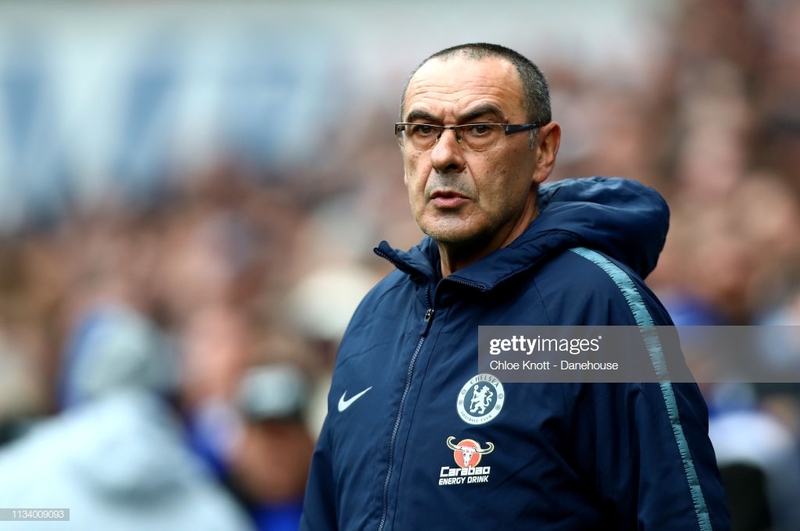 The former-Napoli boss has come under a lot of scrutiny from the club's supporters after a difficult first season in the Premier League, with jeers of 'we want Sarri out' clearly heard in their narrow win over Cardiff on Sunday. It appeared the Blues would suffer a surprise blow to their top-four hopes when Victor Camarasa's effort just after half-time offered Neil Warnock's side a huge lifeline in their bid to avoid relegation. However, with the help of some suspect officiating and a late throw of the dice from Sarri, Cesar Azpilicueta's header and a stoppage time strike from Ruben Loftus-Cheek sealed a comeback win. Sarri has struggled to keep fans on his side amid a series of suspect decisions, the latest of which stemmed from resting Eden Hazard and N'Golo Kante at the weekend while Callum Hudson-Odoi went another game without a first top-flight start. Indeed, critics have suggested that his possession based ethos has yet to come to fruition, instead exposing Chelsea's defensive weaknesses on a number of occasions. Yet, the manager remains defiant in instilling his game plan, suggesting that given time, he can win the fanbase around and deliver the desired results at Stamford Bridge. I know only one way (of satisfying supporters) - we have to win matches," Sarri said. "We have to try to win a trophy. I know only this way." "I think that, in the future, we will be able to fight for the top. At the moment, we are not playing our football very well. We need to improve playing our way of football. So we are trying to do this, but it's not easy." "It's not easy, especially in the first season because we started to work only in the middle of July. At the beginning of August, we played the first official match."